When your pet dog sneezes, it may be trying to tell you something rather than indicating a cold. Certainly that would be the case for any pet African wild dogs, who use sneezes to measure desire to hunt. African wild dogs (Lycaon pictus) are semi-democratic creatures. Rather than having a leader tell the pack when to migrate or hunt, they engage in greeting ceremonies known as “social rallies” after a resting period. These often, but not always, end with the pack going hunting or seeking a new resting site. In Proceedings of the Royal Society B, Jordan reports that “the number of sneezes needed for the group to depart was reduced whenever dominant individuals initiated rallies, suggesting that dominant participation increases the likelihood of a rally’s success, but is not a prerequisite.” A dominant individual could start a move by starting a rally and getting just three sneezes in response, but 10 sneezes were required to guarantee movement when a lowly ranked individual was the initiator. Dominance in African wild dog packs is less visible than other species, so Jordan and co-authors used priority when feeding to identify dominant individuals. The use of sneezes as a method for expressing opinions has not been seen before, but scientists have used the way groups of social animals decide to leave nesting sites as a window to decision-making. Meerkats are known to emit “moving calls”, and will not shift until at least two, and more often three, pack members vocalize agreement. 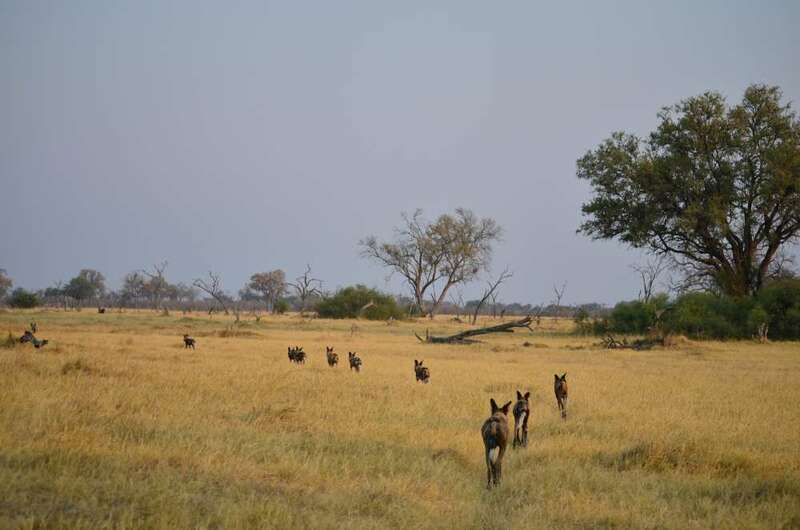 All the packs studied were from the Okavango Delta, Botswana, so it is not yet known if the behavior is universal to Lycaon pictus. Botswana represents the largest remaining habitat for the endangered species, but they survive in pockets across Africa as distant as Algeria. L. pictus is a separate genus from domestic dogs, so the last common ancestor with your labrador or poodle is not recent. African wild dogs are considered the most social of the canids, with little aggression within the group and a willingness to let pups feed before adults. It is not known whether upper respiratory tract infections sweeping through a pack keep them permanently on the move.